Fig 1. Picture from the ice camp capturing one of the installation holes during the string installation. Usually a small group (3-5 people) is able to install one string with 36 optical modules in 3-4 days. In the picture, there is a crane which holds the whole string before it reaches the lakebed and yellow and orange boxes where all the new optical modules are kept before installation. Neutrinos, as many may know, are particles that don’t often interact with the surroundings. As is obvious from the name, neutrinos are (electrically) neutral. They only interact with two forces: weak subatomic force and gravity. This is great news on one hand, and an incredibly problematic issue on the other. Why? When imagining a particle that is electrically neutral and doesn’t interact with virtually anything but the very weak forces of nature, one can immediately think that this is great, because if you manage to find such particle you can, very accurately, pin-point the location where it came from. If it doesn’t interact with anything along the way to your detector, its trajectory will not change at all on the way to your detector, which means that one can easily find the origin of said trajectory. However, there is a second side to this double-edged neutrino sword. One must first detect such particle, in order to know where it came from. And that is a very difficult task. The detector itself, called Gigaton Volume Detector (GVD), is a giant on its own, as we already said, if you’re looking for neutrinos, you have to have a wide field of view. The basic detector unit is a so called Optical Module (OM), a spherical glass ball capable of detecting photons passing through the lake. These photons are created through Cherenkov Effect by charged particles, which are created in the The OMs are connected via strings that form a heptagonal shape, creating a cluster. One cluster has 288 optical modules connected to it. All of this creates a 3D network of detectors capable of finding the very rare neutrinos. It all may sound easy, however there is still the issue of neutrinos being electrically neutral. So how can one identify a particle running through the detector, if it doesn’t interact with it whatsoever? Well the answer is, you can’t. At least, not in a straight-forward way. We can, however, detect a neutrino indirectly, by looking for a typical light pattern created by charge particles which are created in the Charge Current (CC) and Neutral Current (NC) Weak interactions of the neutrinos. Since the Cherenkov light is emitted under a constant angle with respect to the charge particle tracks , so it is possible to reconstruct charge particle path and thus also find the origin of the neutrinos. Fig 2. Optical module. In the lower part you can see a Hamamatsu PMT glued with special optical glue and also a Faraday cage which encloses the PMT. In the upper part the control electronics and calibration LEDs are shown. 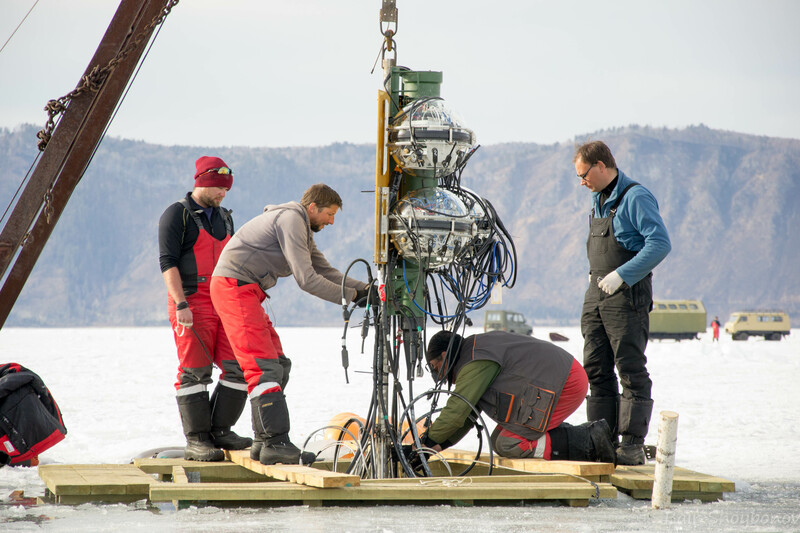 There is one more advantage of why you would want to put the detector in Lake Baikal. Russian winters get cold, very cold. This enables for an easy access to the surface of the lake, even with heavy machinery, as the thickness of the ice cap can reach up to 80 centimeters and can withstand a lot of heavy weight. Expeditions to Baikal take place from half of the February to half of the April, when the ice is at its strongest. Up until 2015, the expeditions, and the project as a whole, consisted only of Russian members. However, with the year 2015, the expedition was expanded by two contributors, Institute of experimental and applied physics in Prague and the department of Mathematics, physics and informatics from Comenius University in Bratislava. The teams are lead by doc. Ing. Ivan Štekl, CSc. and prof. RNDr. Fedor Šimkovic, CSc, respectively. These teams, are not only taking part in the software development parts of the project, but also join the expeditions to the field. The latest expedition to Baikal was accompanied by a member from IEAP Mgr. Lukáš Fajt. On his three week campaign, starting 5th March, he helped with the installation of the third cluster as well as with repairs of the two older clusters. This year, the whole installation processes was significantly improved, which in turn enables more clusters to be stationed with lesser effort in the next years. This means that two clusters can be installed yearly, which marginally improves the effectivity of the project’s future. The first phase of the detector construction should be finished in 2020 when 8 clusters will be deployed and detecting neutrinos with effective volume 0.4 km3. In the meantime, there is still plenty of work on the software development, calibrations, data analysis and track reconstructions. 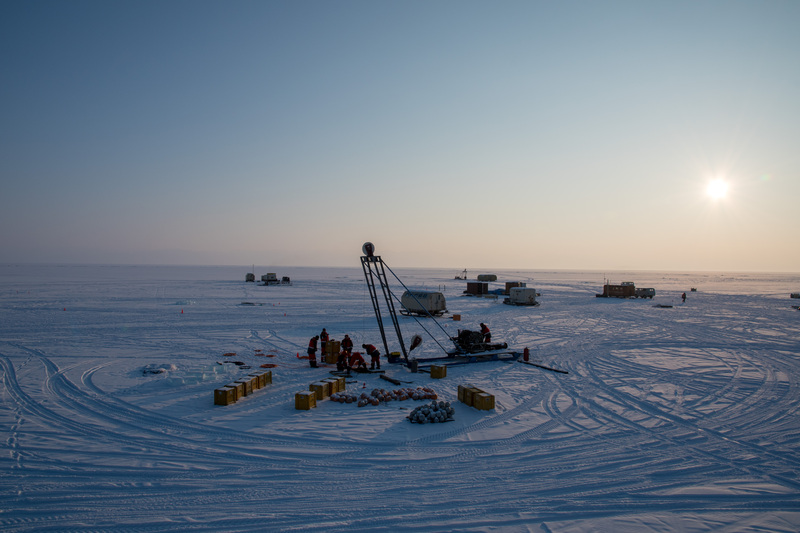 If everything goes well, the first neutrino tracks will be found in data soon. Stay tuned. Fig 3. 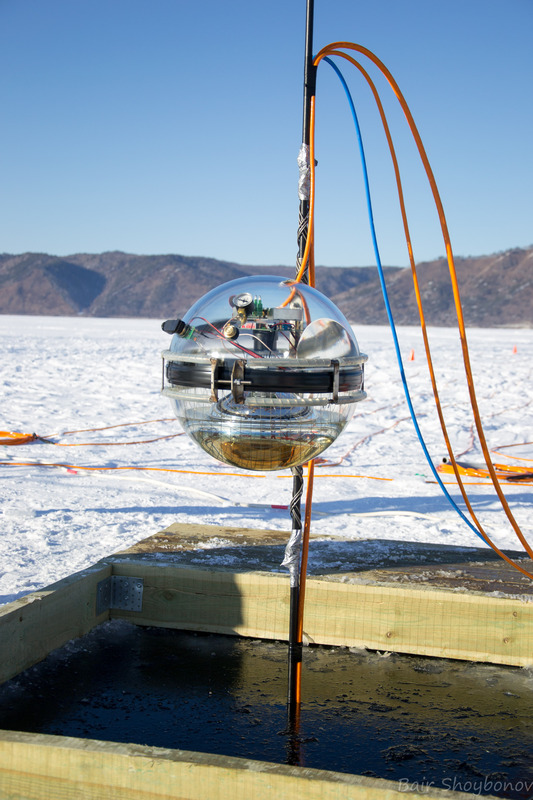 Team of researchers working on installation of one of the strings of the detector on Lake Baikal.